it under a projecting rock, where I saw an old mat and some sticks and rubbish; immediately they set up a terrible outcry that the place was taboo because somebody had died there. I said I did not care; but they gave me to understand that if I persisted, they should all die. I assured them that if they did not make the fire, nor come near it, certainly nothing could harm them, and as for myself I was very willing to run the risk. At last they gave in, seeing I was determined to have my own way. I wanted something to eat, and told them to put my pot on. It was brought, and I placed it on my own fire; however, seeing that theirs was better than mine, I took it off and carried it over to theirs. Before I could set it down, they snatched it out of my hand, and made a worse outcry than ever. Their fire was taboo; it was the fire they had brought in the canoe, and was not for cooking. I was greatly annoyed, and gave them a good scolding for their nonsense, telling the missionary lads that they ought to know better than attend to such stuff. At length they agreed to make a fire in earnest, especially when I pointed out to them that unless they did so, they would have nothing to eat most likely for that day and the next, as it was not probable the swell on the lake would subside very quickly after such a gale of wind. When they had pitched the tent and had lighted the fire, I allowed them to kill a pig, which set all right; at all events, I heard no more about the taboo. The gale increased all night, and it was lucky I had broken the taboo of the corner sheltered by the projecting rock, of which the natives now gladly availed themselves. I think had it not been for this they would have died of the wet and cold, as there was no possibility of making a shelter of branches, &c., which they usually do when they have occasion to sleep in the woods in bad weather. rain ceased. Found several curious plants; an Andromeda, and a very curious Rubus with a gigantic woody climbing stem; the plant and leaves covered with bright yellow prickles. him which nobody could fail to observe and admire. It was a most kindly-meant thing of the old man to send his sons with me, and they were of great use as letters of introduction; in fact, of far greater use than nine out of ten of such letters which I have delivered. The natives about Towpo were not so well-looking a set as they are in some other parts of the island; this was more remarkable in the women than in the men: the handsomest girls I saw were two daughters of old Pirata, who, with their fine mats wrapped round their waists, looked quite as graceful as many of the pictures of Hindoo girls I have seen in similar dresses - or rather I should say, in dresses similarly worn, - for the thick New Zealand mats would not be very comfortable dresses in India. The older women, and particularly those who have children, wear their mats over their shoulders instead of round their waists; which is not near so graceful, but becomes them better, as I do not consider suckling improves the form especially among those, who, like the New Hollanders, &c., suckle their children over their shoulders. roundabout way, in order to afford an excuse for staying there all night: however, on inquiry I found we were not going at all towards it, but direct to the Waikato, on our way homewards. I now began to repent of not having allowed any food to be brought, as I knew well it was a tremendous distance to any potatoe-ground, and that we should be half-starved before we got there. About mid-day we gained the road by which we had arrived at Pirata, and continued in it for several hours: we then struck off toward the south-east, so as to cross the Waikato at a higher point than we had done before, and our course ceased to be over the barren moor which I have before mentioned. The wood was part of the same belt I have already spoken of as running parallel with the course of the Waikato. At the part where we now crossed, there was the finest forest I had seen in New Zealand; the trees were chiefly Totara of gigantic size, and grew close together. The land also was very rich and level. I here saw some of the largest Fuchsia trees (Pohutukataka) I had met with in the country; they were at least a foot in diameter, - the wood is almost as light as cork, - the flowers are about the size of those of the common Fuchsia, but not so brilliant; it is a deciduous tree. tent about an hour after; but I began to fear the others had taken a different road, as they did not come up till eight o’clock: they were all dreadfully fatigued, which was not to be wondered at, as they had had nothing to eat from six in the morning, except a few raw potatoes and raw craw-fish, perhaps at the rate of two potatoes and one craw-fish each man. I did not, however, pity them much, as if they had not deceived me about the road they intended to take, they might have arrived at the resting-place long before they did. March 10th. - We this day employed all our strength to carry potatoes, as we knew that none were growing within two days’ journey - the women came with us for the purpose of carrying our first day’s meals. We had great difficulty in crossing the Waikato, owing to the smallness of the canoe and the want of paddles; for the people who had left it there for us had, I suppose, hidden them so completely, that we could not find them in half an hour’s search, and consequently were obliged to pull her for about five miles against a current like a mill-stream. The road over which we now passed to Roturoa, I have already described. March 12th. - Last night, at about ten miles’ distance, we could plainly smell the hot springs of Roturoa. We got into the great Pa at ten o’clock, but were obliged to remain there all day in consequence of the wind not permitting us to cross over to Mr. Chapman’s in a canoe. During my absence, the Waikato people had attacked Muckatoo - a town on the sea-coast east of Tawranga, which belonged to the Roturoa people, who said they thought Mr. Chapman was gone there to try to make peace. This news made me more than ever anxious to get over to the mission-house, and I exerted all my eloquence to persuade the natives to launch a canoe, but to no purpose. When at last they chose to take me ever, it was after tea-time at Mr. Chapman’s. I did not then know what was their reason for keeping me there so long, as I was sure they could have crossed the lake before, had they chosen to do so. I afterwards discovered they were debating whether or not they should kill my two Waikato men, Moning-aw and Mahia, and were only prevented by the opposition of Rangey O’Nare, and the consideration that they were but slaves; it had been such a nice point that they had actually loaded a musket to shoot them. I am very glad I did not know this at the time, for I might have made matters worse than they turned out, as I was uncommonly angry at being kept there so long, and the having nothing to eat all day had not improved my temper: although very hungry I did not like eating what was dressed in the hot springs; and there was no wood to be had in the whole Pa for love or money. I had an instance to-day of the great value the natives sometimes set on their ornaments of green stone maries (meri), as the whites call them. I saw one which I admired, which was not so elaborately carved as some are, but simply a straight piece about five inches long and half an inch wide; on my asking the native to sell it, he had the moderation to demand my double-barrel gun for it, nor would he lower his price: this was in fact but another way of telling me that he would not sell it at all, it having been a present from a deceased friend. These pieces of jude might be very easily imitated in England, but I do not think, they would then be valued by the natives more than large beads, or anything else of the kind, as their value certainly arises from their having been made by a friend who is dead, and given by him to the possessor - somewhat in the same way we value a keepsake; but the feeling is of a much more superstitious character with these people than with us. extremely kind manner in which Mr. and Mrs. Chapman received me. I shall never forget the pleasure of that evening. The tea and bread were great delicacies to me, as I had not tasted either for several days, although I had been very sparing of the supply of bread I took with me, and had managed to keep it much longer than I otherwise should, by cutting it into slices and drying it before the fire: my tea and sugar had been washed away in crossing Towpo. Mr. Chapman was delighted to learn that I had been able to ascend to the summit of Tongadido, as the natives had always asserted to him that it was impossible, in consequence of the precipitous nature of the ascent; but he intended to try it when he next went there: he said the news of my having ascended the mountain would soon be carried all over the island, as indeed I found afterwards it had. The report of the attack on Muckatoo was quite true, and at the time I arrived, several young natives who had been despatched there on missionary business had been taken prisoners, and it was expected that some had been killed: under all the circumstances, Mr. Chapman said he should not feel justified in allowing me to proceed to Tawranga, until he had received further news of the war party, who were said to be actually occupying the road I should have to travel. I accordingly passed several days at Roturoa, and employed myself very pleasantly in examining the different hotsprings and solfataras around the lake; at the same time I made several valuable additions to my collection of plants. however, slightly styptic, and many of the rocks near are covered with an efflorescence very like concrete sulphuric acid, but is, I suppose, an aluminous salt with a great excess of acid. The natives of Roturoa have very bad teeth, said to be the consequence of always eating their food cooked in these streams; but I saw many of them here with as good teeth as elsewhere: there was one girl at Mr. Chapman’s who had, I think, as fine a set of teeth as I ever beheld, and she was altogether so beautiful that I very much wished for her likeness, to have sent to England as a favourable specimen of New Zealand beauty. I discovered in the woods here a species of Eugenia, bearing an eatable fruit, and a most beautiful epiphytal orchideous plant [probably Earina mucronata], with a very powerful perfume: if this plant would grow out of doors in England, as I think likely, it would be quite a new feature in gardens. I bought for two blue beads a cockatoo or rather parrot (nestor), the most common bird in New Zealand, and good to eat - the natives catch them by means of tame ones: they make a little shelter in the woods, and then hide themselves in it, with a stick in one hand, and a string, to which the bird is tied, in the other; they then tease the parrot, which makes a great noise, when the others come to fight him, and are knocked down. It is strange so sly a bird should be caught in such a way, as I could never manage to get near enough to shoot one. The tame parrots or “cacas” have always an ornamental ring round one of their legs, which is generally made of human bone. not to make much fire in the morning, lest the smoke should betray us to any outlying war-party. Thursday, March 22nd. - We encamped in the evening at the same place as on our first night from Tawranga. We were then in a sheltered place, and although we could have gone several miles farther towards our journey’s end, we thought this preferable, the remaining part of the road being an open plain, where we should have been exposed by the light of our fires for twenty miles around, and morning might have found us all with our throats cut. We passed during the day, with some anxiety, the road which led from the Waikato to Muckatoo, where the war party was said to have encamped while we were at Roturoa; but no war-party had been there, for the path required good eyes to discover it. We found the marks of three people having slept not far from our last encampment, and there was no doubt that the dog which caused us so much alarm belonged to them. We afterwards learnt they were Tawranga people returning from Roturoa, and had set out from a different part of the lake on the same day as ourselves. Friday, March 23rd. - The hottest day I felt in New Zealand. Thermometer 65. The view of Tawranga as you approach it from the land side is very beautiful; Manganorie, the solitary hill at the entrance of the harbour, is a splendid object; were it necessary it might be made a second Gibraltar. When I arrived at the missionary station there were three vessels in the harbour, so that I did not expect much difficulty in getting up to the Bay of Islands. I also learnt that a large war-party, or Tower, was on its way from Muckatoo to the Waikato, and was expected daily, and that there was no truth in the report of a party having been between Tawranga and Roturoa. willingly have explored the Waikato country, but was dissuaded by the missionaries, who said I was certain of being robbed, as a war-party never respected persons, and that even the missionaries themselves would be stripped if they were to fall in with a party on its march. They so strongly dissuaded me from going that I waited for several days; but as there was no further sign of the “Tower” I began to get impatient, and at last made up my mind to set off and run the risk of meeting them. I provided myself with a sort of safe-conduct from the wife of a white man at Tawranga, who was a Waikato woman and a chief, and a great friend of mine; and also I took a white man with me who knew the people well. It was, however, obvious that “Mary” or “A-poi,” the woman I have mentioned, did not place much confidence in the forbearance of her friends, even when visiting them with a kind of letter of introduction from her, for she sent me by a road at least thirty miles out of my way, for no other reason that I know of than that I might not run the risk of meeting her countrymen. of the natives. The cliffs we passed on this day’s journey were very curious, they were about twenty or thirty feet from the water, and consisted of perfectly horizontal layers of a clay resembling chalk in appearance, but composed of decayed pumice, with occasional intervening layers of a black vegetable substance evidently passing into coal. One of the seams was about a foot thick, it was the under one, but had no consistency, and when pressed it crumbled in the hand so as to discover its component parts, which were leaves, twigs, and seed-vessels of plants now forming the flowers of the island; this must be as recent a coal formation as may be seen in any part of the world. The natives said that they used it as fuel, but they cannot do so to any extent, as the trouble of procuring it would be greater than would be required to get wood, owing to its situation, at or rather below the edge of high-water mark. eaten by the natives, as well as the soft part of the head of the trunk, corresponding to the cabbage of the palm. In its natural state it is very slimy, so that if you bite it, you will find some difficulty in spitting it out again; but by long baking in the native ovens, it becomes of somewhat the consistency of baked apple, which it would resemble in taste if it were at all acid. Nevertheless, it is by no means disagreeable. I measured some fronds twenty-two feet long, and at the base eight and a half inches in circumference; it far exceeds in beauty any other fern-tree I have ever seen; the largest trunks were not more than eight inches diameter. I was surprised to learn that fern-trees are very easily transplanted; in fact, if out off with an axe, and the trunk buried about a foot, it will rarely fail of growing after a short time. This range of mountains was level at the top, and when viewed from a distance appeared like a wall. I however found it difficult to determine when we were on the highest part of the pass, as we traversed many minor hills and valleys while actually on the top of the range. I was at last much pleased to get a glimpse of a great plain to the westward, which showed at all events we had at length actually passed the highest part. I imagine this range to be about 4000 feet high at the north end; it becomes very gradually lower towards the south, but still keeps its wall-like appearance: on this range as well as on several high hills along the coast, there are very singular pillar - like rocks standing in groups on the summit, some of them cannot be less than a hundred feet high, and yet appear mere pillars. I regret that I was never able to approach any of them so as to discover of what kind of rock they were composed they always appeared to be completely covered with bushes, so that they could not be clusters of pillars of columnar basalt, which would have remained naked from the imperishability of its nature. At one point of to-day’s journey on a narrow neck of land, which was far from being the highest, I saw the ocean to the eastward, where it appeared close beneath my feet - and westward about fifty miles distance, at a place called Carwia or Carfwea - for I do not know the correct orthography of the name, which is a very puzzling one to spell, as we have no letters to represent the peculiar blending of the “r” with some other sound before the “w,” it might as well be an “h” as an “f,” but most Europeans, to make the matter easy, call it at once “Carfeea.” We met a party of about a dozen natives, chiefly women, who were going to join the “Tower;” they said that the great party had left Mattamatta three days before, so that we were sure not to meet them, - a piece of intelligence I confess I was not sorry to receive. beautiful scarlet and black fruit, which looked like a blaze of flowers. Here the natives brought me to a pool, saying that I ought to wash, in order to be clean when we came to the Pa, which was close by. I was much amused at this piece of vanity, which I humoured, because it was agreeable to myself, and not that I cared how I looked on my arrival before the critics of Mattamatta. The natives it was evident did not like appearing as guides to a shabby fellow, and thought it would raise their consequence with their friends if I looked more like a great man than was usually the case with their visitors. Mattamatta is situated on a slight elevation in the middle of the plain, and is a Pa of some consequence. Its chief defence besides the stockades consists in the marshes which almost surround it. There was a mission establishment at Mattamatta, (or as the missionaries call it, Matamata,) but it was abandoned in consequence of the bad conduct of the natives, who robbed the resident missionary (Rev. A. M. Brown, now of Tawranga); they are now very desirous of persuading missionaries to return, but do not deserve to succeed. In consequence of the war party having drained the population, there were none but old men, young women, and children, in Mattamatta. The women were the best-looking set I ever saw; they were almost all strikingly handsome. The natives of this place have a very indifferent character, so that although it is many years since white men first visited it, there was but one resident at this time, and he was from home. As it is one of the best places in the island for buying pigs, it is evident there must be some truth in the reports of their bad propensities, or more persons would venture there to secure so good a harvest. The native who had charge of this man’s house, permitted us the free use of it, as if it had been his own. It was a terribly ruinous place, built many years since, when Mattamatta was a great mart for flax. In the plains near, I saw the finest specimens of the flax-plant I ever met with; they were at least twelve feet high, covered miles of the plain, and were growing in all the moist places not actually bog. The people brought large baskets full of the berries of the Kaikatora (Dacrydium excelsum) for sale. I bought them at the rate of one inch of tobacco for a bushel: these berries are very like those of the yew, but not slimy: they are good tasted, and form a great part of the food of the natives during the season in those places where the trees are abundant; they are produced in such quantities as to give the trees a scarlet appearance. mittee of the House of Lords,) and left to find his way home to Tawranga in his shirt. The “Tower” had made this a resting place, and there were sheds enough erected to accommodate about five hundred men; the place as usual was swarming with fleas. The encampment was put up without much regard to order; the greater part of it consisted of sheds about four feet high, open on one side, and very long; one was a hundred and fifty feet, and just wide enough for a man to lie across. It was exceedingly cold, and wood was very scarce, the war-party having consumed every bit that could easily be procured. The mountain rose almost perpendicularly behind us, and was bare for a small distance from each side of the path, everywhere else it was thickly clothed with wood. The river from the waterfall, which I have before spoken of, ran within fifty yards of our feet in a deep ravine, the sides of which were more thickly covered with fern-trees than I ever saw elsewhere. I think that the glowing terms in which many speak of the ferns are not borne out by their general appearance; it is only when seen from above that they are such surpassingly beautiful objects; seen from below I do not think they are equal in beauty to the generality of palms. While the supper was cooking I tried to reach a waterfall in the vicinity of our resting place, but was benighted on the mountain, and should probably have lost my way had it not been for the fires of the party below me. I got far enough to see that the only possible way to reach the edge of the fall would be to walk down the bed of the river; for how great a distance I could not then tell, but was determined to try next morning. waded down it till I reached the edge of the fall, which is at least five hundred feet perpendicular; and, although not a fall of much consequence, so far as the amount of water is concerned, it is the largest I have seen in New Zealand; and indeed, if it were in Europe, would be considered well worth travelling many miles to see. I was much astonished at so considerable a stream running from what appeared so narrow a ridge of land, for seen from the plain the Arrohaw range appears a mere wall. It was not till I had travelled for the whole day on nearly level land across the range that I could believe myself so much deceived: every quarter of an hour as I went on I expected to get a glimpse of the sea, but did not reach the other declivity till about four p.m. The whole of the range is thickly timbered, and the soil good and well watered with small streams; the ascent from the land (west) side is, unfortunately, nearly impracticable for carriages of any description, but on the sea (east) side it is much more gentle. The road was dreadfully bad, owing to the passage of so large a body of men over the soft clayey soil, and in so narrow a path; for they must have travelled, as usual, in single file. of my natives went on to see where, the “Tower” was, and reported that it was over the hill at the bottom of which we were encamped. I was rather alarmed at this news, thinking they might come back and rob us in the morning, in order to get themselves into practice for their intended exploit at Muckatoo; they did not however molest us, and we passed the night in quietness. sorry that these fellows stayed behind; because, being the steadiest and most trustworthy of my followers, I had given them my dried plants to take care of, and I thought it too much to expect that they would be able to prevent such a prize as a dozen quires of cartridge-paper from being distributed amongst their friends. I consequently gave up as lost my much-prized specimens, and was proportionately overjoyed when I saw them enter Otumoiti about two hours after me, with their loads quite safe. People in England imagine that splendid specimens of carving are common among the New Zealanders, but such is far from being the case; the only specimen I met with in the country, which I thought worth having, was a paddle I saw to-day; it was most beautifully carved all over the blade, and I tried to buy it, and even offered ten pounds of tobacco for it, but without success. It was “taboo,” and I dare say the value of one hundred pounds would not have bought it at this time, as it was, I understood, connected in some way with the present war. the marks do not at all affect the smoothness of the skin. I have seen the arms and bodies of the New Zealand women so covered with these powerful blue marks, that they looked as if they had on them a tight-fitting figured chintz dress. April 4th. - The war party do not seem much inclined to fight - they have been a fortnight advancing a distance which ought to have been easily travelled in two days - they did not reach Otumoiti till this evening, and will, I am happy to say, leave it early to-morrow morning, in order to save the tide, as did they not leave at the time of low water, they would have about a dozen miles further to march. Although the war-party are perfectly friendly with the Tawranga tribe, and in fact, are at present fighting the battles of the latter, yet the white people residing at Tawranga are not quite comfortable, and have taken all possible precautions to prevent robbery, even to the locking of their stockades, and securing in them such bulky articles as canoes and boats, which would otherwise have been very probably taken away or destroyed. think it must be a more advantageous situation, geographically considered, than even the Thames. I do not know whether the land about Port Nicholson is as mountainous and barren as it is usually on the coast, but should suppose, from the geological formation in which it is situated, if any level land is to be found in the country it will be in that neighbourhood. I know that coal exists in the neighbourhood, if not actually there; and that would be an additional advantage over the Thames, where there are none but volcanic rocks. At the Thames I first saw the pine or cowrie (Kawri), which does not grow to the southward of that place. It is always a sign of bad land, and grows so sparingly even in those places where it is found, that I am inclined to think in ten years New Zealand planks and spars will be more scarce than they are at present. Independently of the rarity of the tree, a great drawback to its value is that it grows only on the tops and sides of steep hills, from whence it is very difficult to transport. At present the supply is obtained from the most accessible spots, the sides of hills next the sea and rivers; but even now these situations are becoming quite denuded of their timber; and I am sure that twenty ships a year would quite exhaust the supply of cowrie in ten years or less, or at all events that part of the supply which could be got at so easily as to be profitable for exportation. carry collected by one woman during the space of a tide; Scallops are also tolerably abundant, and are most delicious eating. There are no Lobsters nor Crabs, but a great abundance of fish of all kinds; one, the Salmon of the English, or Carwai (Carwhy), is a most excellent fish, the best I have tasted in the southern hemisphere; it is about the size of a salmon, and so like it in figure, fins, &c., that I should think it must belong to an allied family. Flat-fish are also more abundant than they usually are on these coasts, but I have never tasted any equal even to a Plaice. All the fish in New Zealand are much superior to those in New Holland, which, indeed, they can easily be, for such a set of wretched, tasteless things as these of the latter I did not believe could have been found. The natives about the Thames are not numerous, but a very bad set, great thieves, and very impudent. One of the largest canoes ever seen is now in the great Pa at the Thames, Wakautiwai (Wokatuwhy); it is eighty-eight feet long, and highly finished. It belonged to a Bay of Islands chief, who came down to the Thames to fight, and got beaten; I believe he was a great rascal - at least so say all the whites. called back in great haste by the missionary lads for fear I should be seen there, and stripped for my infraction of their laws; and this was actually within a hundred yards of the house of a missionary. The natives always require an additional consideration for taking off the “taboo,” or making “noa” any places which may be included in a purchase. I could not discover. if the “taboo” was lost by lapse of time, but suppose it must be so by reason of the forgetfulness of the people, for as they dare not approach these prohibited places so as to renew the marks of prohibition, the original marks - sometimes a bundle of rags, sometimes a bit of human flesh, or other perishable article - become lost, and in time the places are again approached and built upon, for they are generally the sites of houses or the like places. Were it not for something of this kind, these places must have been much more numerous than they are, although even now they are sufficiently so to be very disagreeable to a stranger. These rambles were abruptly put an end to by the increasing business of the mercantile firm at Sydney with which I am connected; and my time and attention became occupied in other pursuits. But soon after my return to Sydney it was determined that I should go again to New Zealand on commercial business, and having resided for some time at Port Nicholson and its neighbourhood, I am, at this time, (August 1840,) enabled to add many further particulars respecting the country from my own continued personal observation. ment of the available lands. At the back of the harbour the mountains rise very abruptly to about 4000 feet, and there is no passage from thence to the level lands at the head of the gulf. The land is all quite as steep as that in the neighbourhood of Port Nicholson between Britannia and Thorndon, and the shores so bold and rugged that it is impossible to walk for any distance along them. The only harbour which is worth mentioning at present is Waitemati, the intended new settlement; it is a good harbour, but very little known; when I was there it had never been entered by vessels of any burthen - the land is more level than on the southern side, but the soil is bad and very swampy, and wood for fuel even is very scarce; it is from thirty to forty miles from the rich level lands which are held out as the inducement to draw settlers to the Thames, and land-carriage at present is impracticable. The mountainous land on the Thames is generally covered with timber, but from the rugged character of the ground where it grows its value is greatly diminished, as the cost of its transport to the water would be very great. The timber is chiefly the Cowrie pine, which always grows in poor stiff clay soil, very inferior for agricultural purposes to any of the land around Port Nicholson. The river Waiho, or Thames, joins the sea on the south shore near the head of the gulf; the land is swampy for many miles from the mouth of the river, which cannot be entered by vessels of more than ten tons burthen. The Thames runs through a level country, free from timber, for about eighty miles from north to south, and with an average breadth of fifteen miles; the mountains bound it on the east like a wall; they are the same I have spoken of as forming the back ground of Coromandel harbour; at their termination they are quite perpendicular for about one third from their summits, and the remainder so steep as to resemble an artificial embankment. Phormium tenax Forst. | BM t.3199/1832 | BHL. 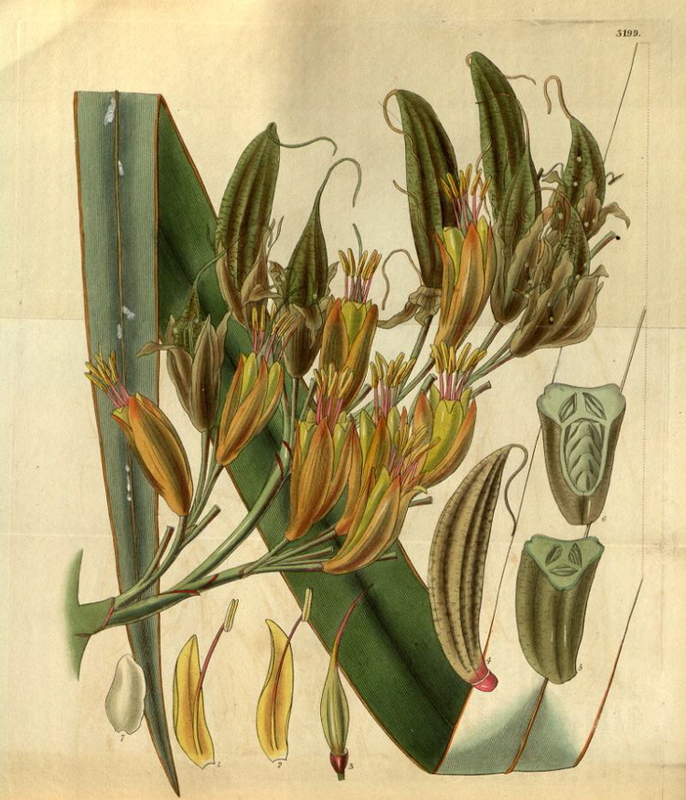 New Zealand Flax is described several times in the text of Rambles.